Nan Khatai (Naan Khat-aa-ee) is a cookie originating from the South Asian country of Pakistan. Extremely light but sweet and just melts in the mouth. Traditionally made with clarified butter or "ghee", using plain unsalted butter would be just fine. This recipe is from my mom's cookbook. 1. In a large mixing bowl beat together the sugar with the butter until fluffy. 2. Stir in the vanilla and both flours (cake flour and semolina flour) to make a soft dough. 3. Pinch off 12 pieces of dough to make 12 balls. 4. Flatten balls between the palms of your hands to form small rounds about 1" (inch) in thickness. 5. With your index finger make a little depression in the centre of each cookie and place an almond in it. 6. Brush each cookie lightly with eggwash. 7. Bake cookies on a greased cookie sheet at 190 degrees C (375 F) for 15 minutes. 8. Cool cookies completely on cookie sheet or cooling rack. 9. Store cookies in an airtight container at room temperature. These are the best cookies, simple to make and deliciously yum. very good recipe, everyone loved it and quite easy and quick too. 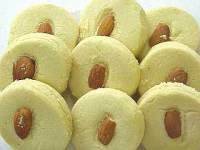 I love to eat Nan Khatais, want to make fat free, please give me advice. these were really good! had to make them for school! thank you very much. I just read this recipe and going to make it right now, but loving it already because the ingredients look like in complete balance. i'm sure it will come out great. Got good naan khatais, but if the receipe could be for more portions, it would have worked marvels. i love it, a very simple and quick recipe. I needed this recipe for school thanks alot!!!! the recipe is very good and inexpensive for everyone. thanks a lot for this great nan khatai recipe. wish you very good luck for all of you. I made Nan Khatais at home. It is excellent NS everybody liked it. qant to make sugar-free, please give me advice. The recipe sounds nice and easy, but Nan Khatai is an Iranian sweet. Excellent, simple, but what are the options if a person does not have an oven/microwave, or if a person has only a microwave? How can they prepare such a simple healthy dish? its very nice but i want to make the one we get from traditional places..... yum. I made these cookies for school and they came out all mushy. Can someone please tell me what I did wrong before this Sunday. Please help me!!! Tried to make these for school three times with my moms help and they were runny and flat. Is 10 tablespoons of butter correct? I was looking for this recipe for a year.Thank God I found it. Awesome, came out really soft. The cookie is made throughout Iran, Pakistan and parts of Afghanistan and India. The name of the cookie itself is Persian/Urdu. A slightly different cookie is Naan Nokhodchi which you can find in Iranian bakeries and in parts of Pakistan as well.